Have you checked out our first Maths Challenge on our Facebook page? During the current tutoring post-exam lull I’ve been picking up a few old interests of mine, one of which is creating an effective Sudoku solver app. 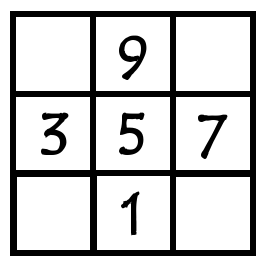 And the first stage in solving a Sudoku puzzle is to understand the maths of magic squares. So what’s mystical about a Magic Square? … Anyway, numbers which, as we can see, even by themselves might be considered mystical also have a prominent place in divine texts. To understand what puts the magic in magic squares we need to believe that events can’t be random because all events must be the will of beneficent or vengeful deities. For the sake of the argument let’s refer to such deities or supernatural entities – Him/Her/Them – as ‘God’, which is how most of our ancestors (and indeed some of our peers) would have it. So, if we live in a universe created by God and driven by God’s will then we argue that if I throw a number of sticks and they land in a particular way then this isn’t chance: it is God’s will. If I throw pebbles in the air then how they fly and where they land is God’s will. When all is God’s will then nothing is left to chance and luck doesn’t exist. Now let’s say we can associate numbers with these seemly random events. Perhaps then we can use these numbers to be able to understand the will of God? Well, possibly… This concept of linking numbers with random events and then associating this with divine power is called Cleromancy, a concept argued over by most major religions in their time. Count up the dots and see that any of the rows, columns and diagonals of this square add to 15. 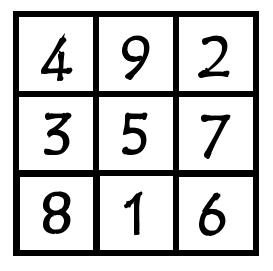 We’ll delve into the I Ching magic square later in this post. Any of the rows, columns and diagonals of this square add to 33, the age of Christ when he died. 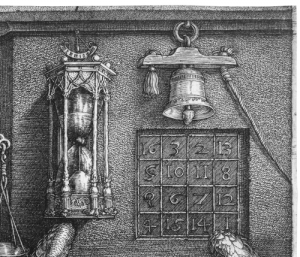 Let’s take a closer look at the magic square in this picture. You’ll see that each column, row and diagonal add to 34, and also each of the four squares in the corners add to 34, making it even more magical. 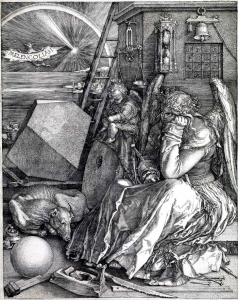 And, not just that, the bottom two squares say 1514 which is when Dürer made the engraving. 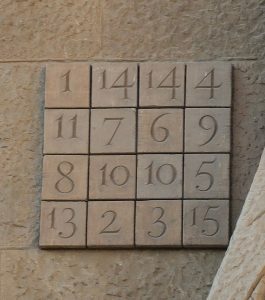 The magic square here has lots of interesting features, including the bottom middle squares showing the date 1514. The letter \(M\) is called the magic constant. 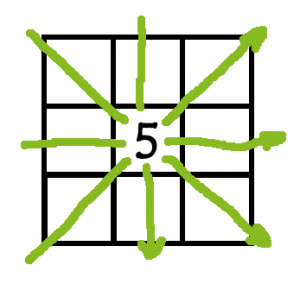 The middle row, middle column and two diagonals (all in green) represent the four arrangements that need to include 5. Therefore 5 must go in the middle. 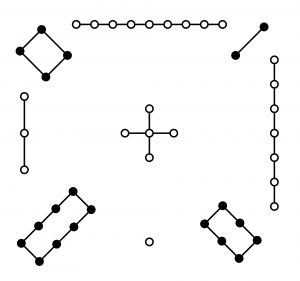 Each odd number only appears in two arrangements so they must go in the middle square on each outer edge. Completing the magic square is then simply a matter of filling in the gaps while ensuring that each row, column and diagonal adds to 15. 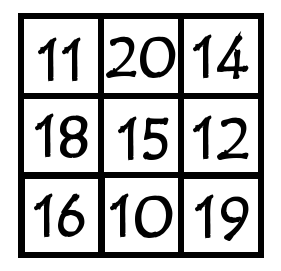 Try using the maths outlined in this post to generate your own 3×3 magic square based on a magic constant of your choice – perhaps your age or the day of the month on which your birthday falls (remember that the numbers can be positive as well as negative). Don’t just limit yourself to numbers. What about shapes? Or colours that mix together on the palette to make a single magic constant colour? If you come up with anything interesting then take a picture and post it below.